Join Soul Surf School on this thrilling surf holiday in breathtaking Australia. 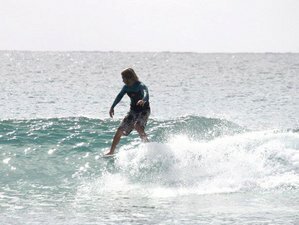 This surf holiday is perfect for beginners who want to try surfing and for advanced surfers who are looking to take their skills to the next level. Experienced and fully accredited instructors will take you through the basics of standing up, paddling, wave selection, and ocean knowledge. Advanced surfers will learn tips and tricks from the experts on how to fine tune their ride on the wave. The surf sessions, which are daily surf safaris, will take you to some stunning surf locations that are perfect for learning to surf. The three lessons are a complete introduction to surfing so whether you have never surfed before or want a refresher course, the experience is tailored specifically for you. Enough time will be spent explaining ocean safety which ensures that you will know the safe area to surf or swim.